GOM Player is one of the leading media players which can run media files in various formats. Most common video formats like AVI, SVI, DIVX, ASX, ASF, WMX, WVX, WMV, MPEG, MPG, VOB, MP4, MKV, MOV etc can be played by it. 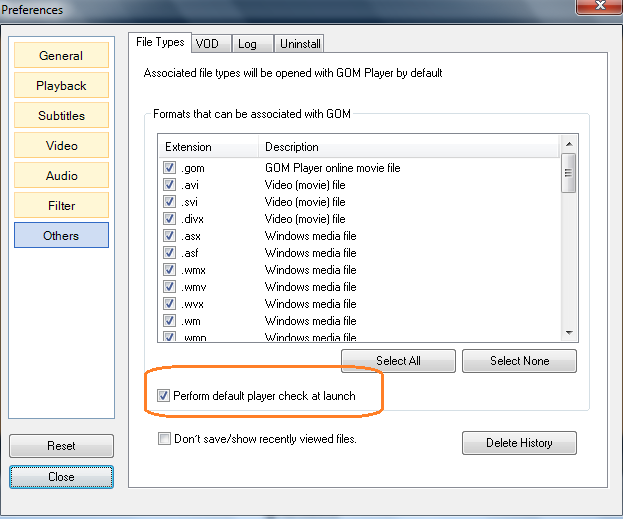 Sometimes when you launch this program, you might receive a message to choose GOM Player as the default playback software for common video file formats. The message looks like Default Player Check: GOM Player can be set as the default playback software for common video file types... You can click either yes or no buttons shows in this message. In case if you are OK with choosing it as the default media player on your computer you can click Yes and you will not receive this message no longer on your computer. If you do not want to set GOM Player as the default tool on your computer and find the continues alerts (Default Player check) as an annoying issue with it, you can disable it. Look at the image below to see how this alert looks like. As long as this program is not set as default, you will receive this popup whenever you run videos using it. As we know, the popup described above can be very disturbing if you don't want to use this GOM software as a primary tool. However, it is not very hard to disable this message once and for all on your laptop. So if this popup troubles you, you can disable it by following the steps below. Now onwards you will not get annoying default player to check messages while you launch it on your computer. GOM Player plays most of the common video formats on your computer and the most important feature is its zero cost. However, you cannot edit or cut video files using this software. in case if you want to edit a certain portion of the video file running on your PC, you can do that by following the steps provided in the link below.